ABC: Beiträge zum Bauen was a magazine on constructivist architecture published in 10 numbers (series of 6 and 4) between 1924 and 1928 in Basel, Switzerland. The editors included Hans Schmidt, Mart Stam, El Lissitzky and Emil Roth. 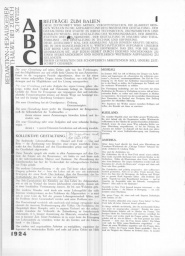 ABC 1 (1924). Download full run in a single PDF (34 mb). The above PDF is sourced from ABK-Stuttgart.de. This page was last modified on 5 September 2015, at 21:31.